If you're like many healthy eaters, you've probably read advice by nutrition experts who promote a plant-based diet. Many people are reducing or eliminating meat to enhance wellness and promote heart health. The plant-based eating style emphasizes fruits and vegetables, of course, but also includes non-meat sources of protein, including nuts and seeds. If you are just beginning to include nuts and seeds in your diet, it is helpful to compare nutritional information and other dietary data to make the best choices for your meal plan. Almost all nuts and seeds are relatively high in calories. This is because they generally contain high amounts of fat. Fat provides nine calories per gram, while protein and carbohydrate provide four calories per gram. Because they are higher in calories, it is smart to be mindful of portion control when consuming nuts or seeds. If you are looking for the lowest calorie nuts and seeds, you might want to choose those that are still in the shell. It's not that these always have fewer calories, but because you have to remove them from the shell to eat them, you eat slower and may consume less as a result. Chestnuts, pistachios, and almonds are lower calorie nuts. Peanuts are also lower in calories, but technically, peanuts are legumes, not nuts. Higher calorie nuts include pecans and macadamia nuts. In general, nuts and seeds are low in carbohydrate. However, there is some variation between the different types. Pecans, macadamia nuts, and Brazil nuts are lower in carbs than many other nut varieties. Chia seeds are lower in carbs, whereas sunflower seeds tend to be higher in carbs. Most of the carbohydrate in nuts and seeds comes from fiber. Nuts and seeds are high in fat, in some cases up to 85 percent fat. So a simple handful of macadamia nuts or walnuts can easily set you back by 500 calories (or roughly a fifth to a quarter of the recommended adult caloric intake). However, the fat in these foods is usually polyunsaturated and monounsaturated fat. These are considered "healthy" fats. Nutrition experts recommend that we replace saturated fat (generally found in meat and dairy products) with unsaturated fats to boost heart health. Both nuts and seeds provide protein, but the amount varies. Hemp, squash, and pumpkin seeds are good choices if you are looking for high-protein selections. Sunflower, sesame, and flax seeds also work well. Higher protein nut choices include peanuts (again, technically not a "nut"), almonds, pistachios, cashews, and walnuts. The vitamins and minerals in nuts and seeds can vary, but many provide vitamin E, thiamin, magnesium, potassium, and several B vitamins. It's helpful to note that nuts also contain phytic acids that can inhibit the absorption of calcium, zinc, and iron. In addition to containing healthy fats and fiber, and micronutrients, most nuts are packed with phytonutrients. This makes sense given that that nuts and seeds are meant to provide nourishment to a seedling until it is able to sprout and grow on its own. Nuts and seeds are loaded with antioxidants. The antioxidants known as the polyphenol in nuts and seed help neutralize free radicals so they can't harm cells in your body. Nuts and seeds help lower cholesterol. The monounsaturated and polyunsaturated fats help transport excess cholesterol to the liver, where they can be excreted from the body in stool. Nuts and seeds can help control diabetes. Because they are low in carbs, they less likely to trigger spikes in blood sugar level, making them the ideal snack for people with type 2 diabetes. Nuts and seeds have anti-inflammatory properties. This is especially true of brazil nuts, pumpkin seeds, walnuts, and chia seeds, all of which are high in omega-3 fatty acids. This may be especially useful for people with diabetes, arthritis, or kidney disease. Nuts and seeds can aid in digestion. This is because they are high in soluble fiber, the type that can absorb water in the intestines to soften stools. Lastly, if you replace meat (especially processed meat) with plant-based protein sources like nuts and seeds you gain health benefits according to research. Studies have indicated that those who follow a plant-based diet benefit from a decreased risk of type 2 diabetes, stroke, heart disease, and other conditions. Eating a diet that is full of plant-based foods—such as nuts and seeds—can help you to reduce your risk for certain diseases including heart disease, type 2 diabetes, hypertension, and stroke. If you are a person who follows a particular eating plan to manage a health condition or for environmental or personal reasons, you might wonder how nuts and seeds can fit into your eating program. Nuts and seeds are a key component of most healthy vegan and vegetarian diets. However, these foods are not complete proteins. Nuts and seeds are incomplete proteins. Incomplete protein sources must be combined with other (complimentary) proteins sources to provide optimal nutrition. The two complimentary proteins compensate for each other's lack of amino acids so that you get the full benefit that complete protein provides. Nuts and seeds are gluten-free in their natural, whole state. However, many of the nuts and seeds that you buy in your local grocery store are not gluten-free and therefore not safe for people with celiac disease or other gluten-sensitivity issues. In fact, even if your nuts or nut mixes do not list a gluten-source on the ingredients list, they still may not be safe. Packaged nuts are often processed in manufacturing sites alongside gluten-containing products. There are, however, some brands that sell nuts and seeds that are marked gluten-free and these would be safe to consume. If you eliminate FODMAPs (fermentable oligo-, di-, monosaccharides, and polyols) from your diet, you can still consume many nuts and seeds, although you may need to limit some of them. According to health sources, low FODMAP nuts include almonds (limit 10), brazil nuts, hazelnuts (limit 10), macadamia nuts, peanuts, pecans, pine nuts, and walnuts. Low FODMAP seeds include caraway, chia, pumpkin, sesame, and sunflower seeds. Most nuts and seeds are fairly low in carbohydrates, making them an excellent snack choice for those following a low-carb diet, including low sugar diets and ketogenic diets. Brazil nuts, walnuts, pecans, macadamia nuts, peanuts, and hazelnuts are especially good choices. Nuts that are higher in carbs include cashews, pistachios, and even pine nuts. If embarking on a strict ketogenic diet, opt for almonds, flax seeds, macadamia nuts, pecans, sunflower seeds, or walnuts, but eat them in moderation. Avoid cashews, chestnuts, chia seed, and pistachios that are far higher in carbohydrates. Also, it's important to take packaging and processing into account. Many nut mixes include high carb ingredients such as pretzels, dried fruit, or crackers. Even the mixes that contain only nuts may be coated with sugar or honey and as a result, provide significant carbohydrate. Nuts and nut butters can be helpful if you are following an eating plan to lose weight. But because they are high in calories and fat, it is important to keep portion control in mind. A single serving of nuts and seeds is usually just a small handful—about one ounce. Some people can consume a single serving and be satisfied. They tend to get filled up on them relatively quickly and are less prone to overeating. However, others might eat mindlessly from a nut bowl and consume too many calories (even though they are primarily healthy calories) as a result. How does the nutrition in raw nuts compare to roasted nuts? While raw nuts are excellent sources of nutrition, those that are roasted may be less so. This is because roasting can damage the healthy fats in nuts and lead to the formation of a harmful substance called acrylamide (which some studies have linked to liver cancer). Moreover, some commercially produced roasted nuts are prepared in oil before being sprinkled with flavorings or dipped in a sugary coating. While tasty, these processes largely undermine the nutritional benefits of the nuts. Should I worry about the fat in nuts if I also consume coconut on my low-carb diet? With dried coconut, for example, you are consuming high amounts of saturated fat, the type that can clog arteries. While occasionally eating an ounce of dried coconut won't cause you any harm, people at risk of heart disease are advised not to eat more than 16 grams of saturated fat per day, according to the 2015 to 2020 Dietary Guidelines for Americans. That is only one ounce of dried coconut. Are nut butters just as healthy as whole nuts? Nut butters, another excellent source of nut protein, are often packed with salt, sugar, stabilizers, and vegetable oil. Even if you opt for a natural nut butter (or make your own), they are so energy dense that it can be easy to eat excessive amounts and undermine a healthy diet. What is the best way to store nuts and seeds? To ensure the best quality, always store nuts and seeds in the refrigerator or freezer so that the oils don't go rancid. 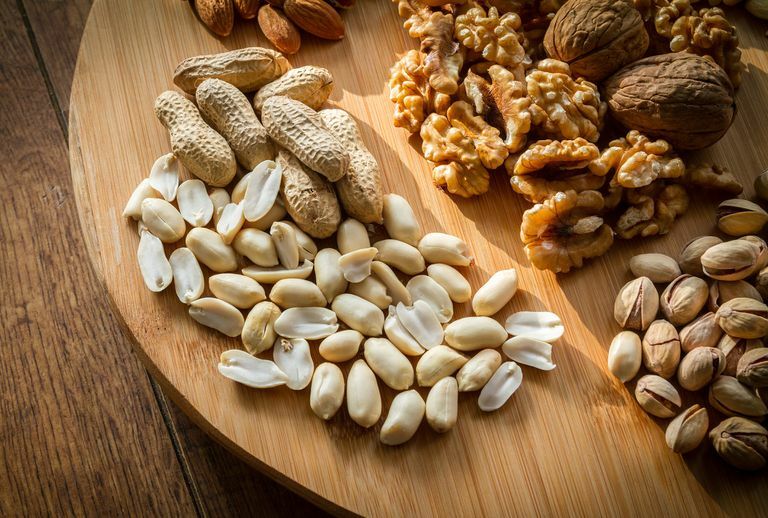 Nuts and seeds with high levels of polyunsaturated fats are especially prone to spoilage, as are those that are either chopped, broken, sliced, or ground into meal. There are countless ways to enjoy nuts and seeds at any meal or as a snack. Many people simply enjoy them whole for a quick boost of protein. But you can also use them in salads, smoothies, on top of yogurt, with oatmeal, in trail mixes, or on top of your favorite frozen dessert. You can also include cook with nuts and seeds. You can't really talk about nuts without mentioning nut allergies. While much of the focus has been placed on peanuts, allergies are also associated with tree nuts. More than three million Americans report having an allergy to peanuts, tree nuts, or both, according to statistics from the American College of Allergy, Asthma, and Immunology (ACAAI). That number only seems to be rising. Nut allergies tend to affect children more than adults. While as many as 20 percent will outgrow their allergies, those who experience allergy symptoms early are more likely to remain allergic for a lifetime. Some allergies can even be life-threatening, leading to a whole-body allergic reaction known as anaphylaxis. Despite these grave concerns, a 2015 study published in the New England Journal of Medicine concluded that children at high risk of developing a peanut allergy are far less likely to develop one if introduced to peanuts before the age of 12 months. In fact, doing so decreased the risk of a peanut allergy by age five from 13.7 percent in children who avoided nuts to 1.9 percent in infants exposed to peanuts before their first birthday. American College of Allergy, Asthma, and Immunology (ACAAI). Newly Issued Clinical Guidelines from the NIAID Recommend the Early Peanut Introduction, Not Avoidance. Milwaukie, Wisconsin; press release issued January 5, 2017. Du Toit. G.; Roberts, G.; Sayer, P. et al. Randomized Trial of Peanut Consumption in Infants at Risk for Peanut Allergy. N Engl J Med. 2015; 372:803-13. DOI: 10.1056/NEJMoa1414850. Preedy, V.; Watson, R.; and Patel, V. (2011) Nuts and Seeds in Health and Disease Prevention (1st Edition). New York: Academic Press. ISBN: 9780123756886. McMacken M, Shah S. A plant-based diet for the prevention and treatment of type 2 diabetes. Journal of Geriatric Cardiology : JGC. 2017;14(5):342-354. DOI: 10.11909/j.issn.1671-5411.2017.05.009.